Upon years of research, our team has meticulously selected 19 active ingredients based on their efficacy and tolerance. Up to three active ingredients can be combined by your doctor when creating each of your bespoke morning and evening serums for targeted results. 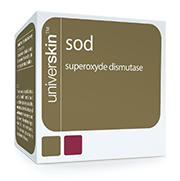 Superoxide Dismutase, or SOD, is a free radical scavenger, balances out the number of excess radicals, ultimately protecting the skin from unnecessary damages. SOD soothes the skin and helps to combat photoageing. 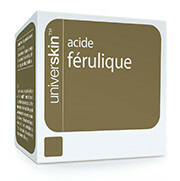 Ferulic acid is a powerful antioxidant. It diminishes the skin free radicals and, therefore, helps slowing the aging process. Vitamin C is a potent antioxidant that can be used to treat and prevent changes associated with photoaging, hyperpigmentation, skin redness, and skin dryness. Being acidic to the skin, it also has exfoliating properties. The soy isoflavones act on the signs of hormonal skin aging. 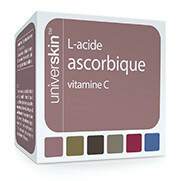 Its antioxidant function helps regulate the pigmentation, and thus improve the radiance of the complexion. It also helps to improve the elasticity and firmness of the skin. DMAE, or dimethylaminoethanol, is the natural precursor of acetylcholine (Ach) and serves as a skin tensor, producing a short-term “lifting effect” and in the long term, improves the firmness of the skin, reduces sagging and decreases wrinkles. An active ingredient derived from Centella asiatica, a medicinal plant that has been used for over 2000 years, Madecassoside is proven to stimulate collagen synthesis and control inflammation. 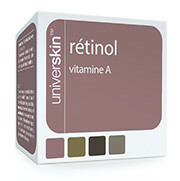 A derivative of Vitamin A, retinol stimulates collagen and elastic fibers synthesis, regulates hyperpigmentation and helps to prevent dark spots. It also act as an exfoliant agent. 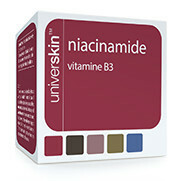 Niacinamide, or Vitamin B3, serves to control skin inflammation, especially inflammation related to acne. It also improves dry skin and regulates hyperpigmentation. It protects and strengthen the blood vessels, thereby preventing visible “broken veins” on the skin surface. Additionally, it drains and improves lymphatic circulation. It serves as a powerful agent against acne and inflammation. Additionally, acting indirectly as a tyrosinase inhibitor, it helps even out skin tone. With wound-healing and anti-inflammatory properties that reduce inflammation, aloe vera stimulates skin healing and regeneration, provides intense hydration and improves the skin’s natural firmness. Derived from Vitamin B5, D-Panthenol contributes to a better skin hydration by repairing the cutaneous barrier. This smallest molecule of naturally occurring ‘fruit acid’ penetrates within the skin to stimulate elimination of dead cells (so-called exfoliation mechanism). The skin looks healthy, radiant and transparent. A strong anti-inflammatory, salicylic acid unclogs blackheads and whiteheads by breaking up the cells in the lining of the skin pore. In addition, its powerful keratolytic action allows dead skin cells to more easily shed. A natural plant antioxidant and skin-lightening, moisturizing agent, phytic acid blocks melanin formation thanks to its antioxidant and chelating properties. Zinc has been shown to actively regulate sebum production and efficiently cleanse the skin. This agent interferes with tyrosinase’s production of melanin in order to treat dark spots and hyperpigmentation. Kojic acid deeply penetrates the skin to limit melanin production and minimize the appearance of dark spots, hyperpigmentation and post-breakout scars. Lactopeptide is a leaven issue from a natural probiotic. It has antibacterial (so-called bacteriocin), anti-inflammatory and seboregulatory actions. It rebalances the cutaneous flora.